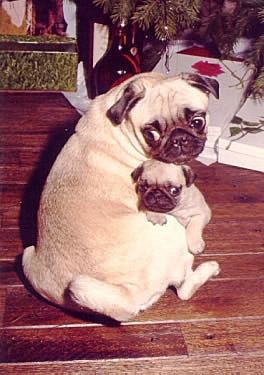 Naturally with Puggie and Missy being such wonderful and devoted pets, or should I say children, we wanted to expand the family to include the pitter patter of little Pug puppies. Missy was a good choice for a Mother as she was very loving. 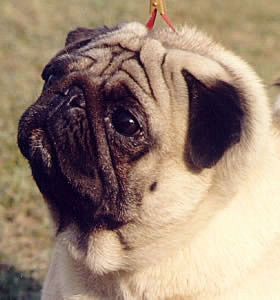 We went in search of a good stud to breed her to and found one in Pennsylvania, a champion show Pug, Ch. Sheffield's Fortune Teller. With the stud selected we made the trip to Pennsylvania to breed her and then waited and waited and waited some more. We were never really sure that the breeding was a success until the day she delivered, and that was a total surprise to us. We'd even seen our vet and she couldn't confirm for us that Missy was pregnant, but she was. Then, on the afternoon of November 23, 1981, I returned home to pack for a short business trip to Chicago. When I entered the house and inquired of Anne where Missy was she informed me that she was sleeping in. 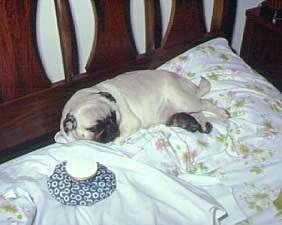 I went upstairs to the bedroom to pack and Missy was indeed curled up on Anne's pillow sleeping. I took a quick shower and when I returned to the bedroom I almost fell over. Missy was cleaning her first born puppy. I quickly got on the phone to the vet to find out what we should do. She informed us to just sit back and wait for the others to arrive and to assist Missy with the cleaning after the puppies were born. Within the hour the second puppy was born and some time later the third. Poor Missy was exhausted by the time the third puppy was born and it fell on me to clean the puppy and make sure it was breathing. These puppies were just a little larger than a good size mouse and totally helpless, but Missy kept a watchful eye out for them and immediately proved she would be a good Mother. I have to admit, Missy did a lot better handling the birth than I did. I was a nervous wreck throughout the whole process and totally exhausted by the time the third one was born. 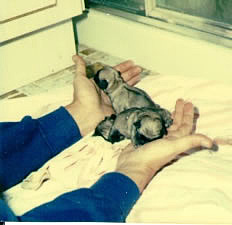 I was also worried to death that the puppies wouldn't make it because they were so tiny and helpless. I quickly changed my travel plans to an early flight the next morning deciding to stay home and make sure they were being well taken care of by Missy. That was probably a mistake because I didn't get a wink of sleep the entire night and left at 5 a.m. for my flight to Chicago. Needless to say I was exhausted the entire day in Chicago, but I managed to make it home that evening to find Mother and puppies thriving. It was difficult, almost impossible, to resist the urge to pick them up and cuddle them, but I knew they shouldn't be handled to much and left them alone. Missy was indeed a good Mother. Very doting and attentive to her puppies. As you can see by the picture (left) she even allowed one of the new kittens in the house to share the puppies box. It was a happy time then watching the little puppies grow, open their eyes and begin to explore the new world around them. It wasn't long before they were crawling out of the box and all over the house. Just a few weeks after the puppies were born Christmas arrived and what a wonderful time they had discovering the tinsel hanging from the tree and the presents strewn beneath it. They use the presents to learn how to mountain climb, and the tinsel to play tug of war. With Christmas came lots of opportunities to take some cute pictures of the puppies. 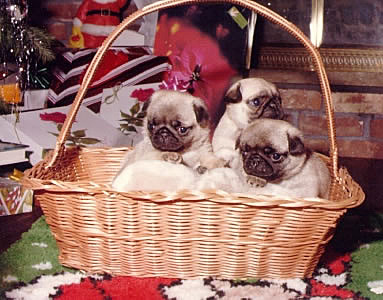 I couldn't resist placing them in the basket and snapping away. They couldn't resist never looking in the same direction at the same time. When the puppies where first born we weren't sure what we were going to do with all of them. We knew we'd keep one and another would go to my Mother and Father, but what about the third one. With the uncertainty of who was going, who was staying, we didn't immediately name the puppies. Playing it safe, we simply called them names relating to their birth order. Number One, Two and Three. 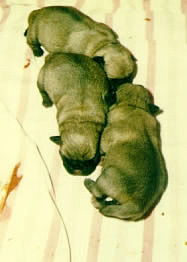 Number One and Three were the best looking Pug puppies with all the traditional markings. Number Two was not the best, but she quickly grew on our affections. She was actually the first to be named. We called her Tu Tu. She loved to run and play. It was apparent after a short time that none of these puppies would ever leave the family. The only question that remained was which one would be give to my Mother and Father? 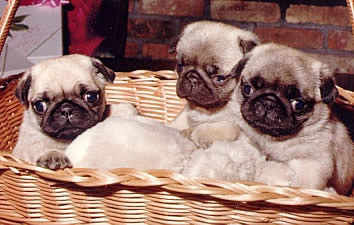 For that answer we returned to the breeder to get their opinion as to which one was the best representation of the Pug breed. 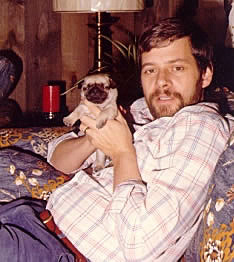 The answer was puppy Number One who was named Missy's Lady Beaujangles, or "Beau" for short. Number Three became Missy's Little Chrisy, or "Chrisy" for short. 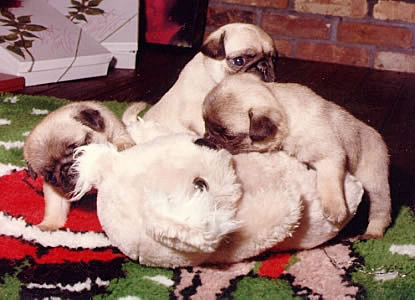 With three puppies running wild under the Christmas tree it was always nice when they got tired and went to sleep. Here one, Chrisy (right), is just about asleep while Beau gnaws on an ear and Tu Tu looks for a nice place to rest her head and go to sleep. It looks like Chrisy's back is going to be the perfect place to take that nap. It was cute watching them cuddle up this little Koala bear stuffed toy as if it was Missy. They enjoyed every minute. 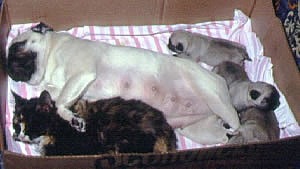 Missy truly was a good mother to the little puppies. 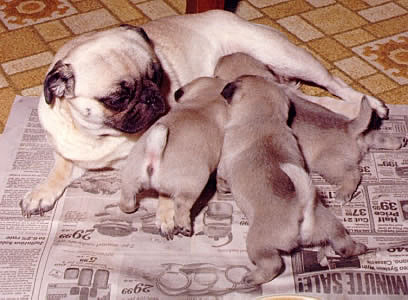 She looked after their every need and at feeding time managed to accommodate three hungry Pug puppies. Anyone who knows anything about Pugs knows that food is top on their priority list and nothing will stop them from getting their fill. Missy eagerly accommodated them and watched them with a doting eye. Fed well they grew fast and were soon lapping up dog food. 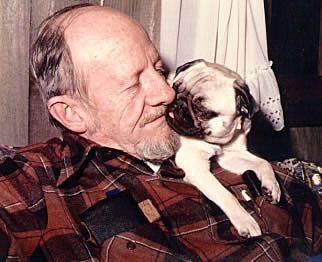 As with children, puppies, too, are always playful and it takes a strong, loving hand to manage them. 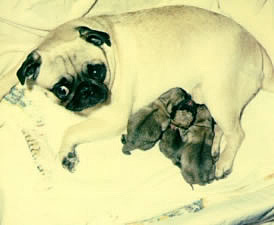 Missy offered that strong, loving hand when her puppies got a bit rambunctious. Here Missy gives Chrisy a stern talking to, not that she really needed it. Times were not always rowdy with the puppies. Quite often things would quiet down and one of the puppies, here it's Tu Tu, would cuddle up with Missy for a few moments of tender loving care. Having the puppies was a wonderful experience. 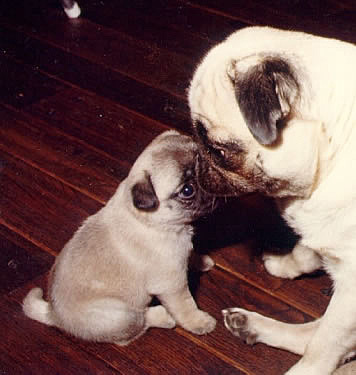 Anyone who loves Pugs would enjoy the experience. 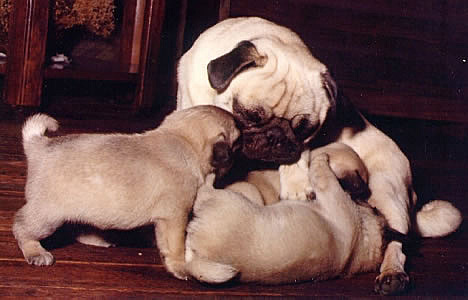 Watching them grow from totally helpless puppies into full grown Pugs brought much joy to our family and is something we will never forget.